A Tamil protester in London who claimed to have fasted for 24 days against the Sri Lankan war has threatened legal action against UK newspapers. Parameswaran Subramaniyan, 28, has denied reports that he secretly ate McDonald's burgers while supposedly holding a prolonged hunger strike. He has also denied being indirectly responsible for the huge bill clocked up by police monitoring the protest. Mr Subramaniyan told the BBC that the reports were "entirely baseless". 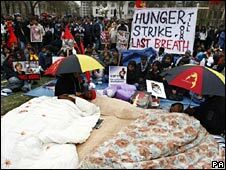 The Sri Lankan asylum seeker was at the centre of long-running demonstrations outside the British parliament in London. For weeks he lay in a tent outside the building as Tamils protested about the plight of their people in Sri Lanka. At one point, his supporters claimed he was "critically weak". The protest finally ended in June, leaving the British police with what the Daily Mail said was a £7.1m ($11,281,730) overtime bill. The newspaper reported that Mr Subramaniyan "eased his ordeal" by secretly eating McDonald's burgers - and was filmed doing so by police surveillance teams using specialist monitoring equipment. The Daily Mail said that police "watched in disbelief as he tucked into the clandestine deliveries" and quoted "a police insider" as saying that it was "the most expensive Big Mac ever". His fast was part of a series of protests by various Sri Lankan Tamil groups which featured hunger strikes, mass sit-ins blocking central London roads and people throwing themselves into the River Thames. Mr Subramaniyan told the BBC that the newspaper's report was a "conspiracy to defame the Tamil struggle". "I have certificates from the doctors who examined me. They warned me that if I had continued for two more days my kidneys would fail. I can challenge them on this," he said. "I even contacted the police and asked them about the news attributed to them. They said they have not given any such information to the media." Police, when contacted by the BBC, said they could not discuss the "specific allegations" relating to his protest. Sri Lanka's long-running ethnic conflict ended in May 2009 when government forces encircled and defeated the Tamil Tigers in the north of the country.